We call ourselves the tortoise and the hare when we hike. Chris, with an abundance of strength, will power through steep hills and each subsequent flight of stairs reaching the crest with his hands on his knees and a few big breaths. I keep us moving, albeit more slowly, relying on endurance and muscles that are predominantly slow twitch. Once I've closed the distance, Chris has recovered and we continue on at a more comfortable pace willing the trail to remain flat. It's a good partnership. Our physical strength and endurance has been tested but in my opinion, has never reached its limits. Our previous hikes took us 100km in 5 days on the Torres del Paine W circuit and 47km in 4 days on the Jaun de Fuca trail. As you can see in the photos below, the trail was often technical including steep cliffs in Patagonia and a multitude of switch backs in BC. The logical next step: 945km in 37 days. We relied on natural ability in the past, however this time were not taking chances. If you follow us on instagram @trailraiserscan you have seen our #wednesdaywalks. This is one way we are preparing for the hike and the logic is simple: train for hiking by hiking. The problem we face is finding the time to put the mileage in, but 14-17km after a full day of work is tiring, and it should be. 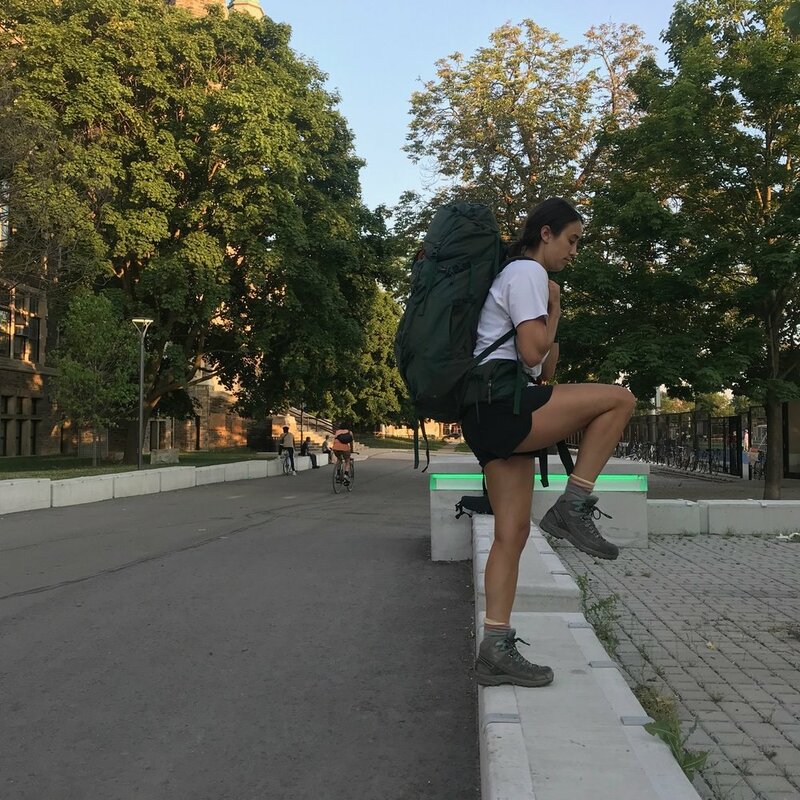 An added perk to our training is that we have had the opportunity to discover some of the amazing trails and green spaces that Toronto has to offer. Here's a snapshot of some of our #wednesdaywalks. Whats your favourite Toronto trail? Do you know of any we haven't hit up yet? Leave a comment below! Since we can't get to the full kilometers needed to mimic the conditions of our daily hikes we have decided to make each short hike more difficult. Our packs currently weigh 35 - 40 lbs which we will plan to cut down to 25 - 30 lbs for the hike. Additionally, we attempt to incorporate hills and stairs into our training hikes. I have also convinced a handful of coworkers to join me Thursdays over lunch on repeats of the stairs into Moore Park ravine. I mean, who wouldn't want to do 6 - 8 reps of 115 steps instead of enjoying a restful lunch. Bonnie Wilkinson, Jag Kanangi and Brittany Dewsbury - you guys rock! A new addition to our training routine is strength conditioning. Yesterday we completed our first circuit training, and we are sore today! That means it's working right? Mid July or early August we plan to book a campsite on the Bruce Trail and stretch our legs. Completing back to back 30km days with overweight packs will give us the confidence to start our hike in September knowing we are fit, strong and as ready as we can be. We think our training schedule means we will be ready to tackle the longest days. However, we don't underestimate the mental fatigue we will endure after 5 weeks of hiking. Stay tuned for September's daily blog posts that will speak to our physical and mental progression as we hike an average of 27km a day.